I thought I would take all of you on a little journey through my bookshelves. 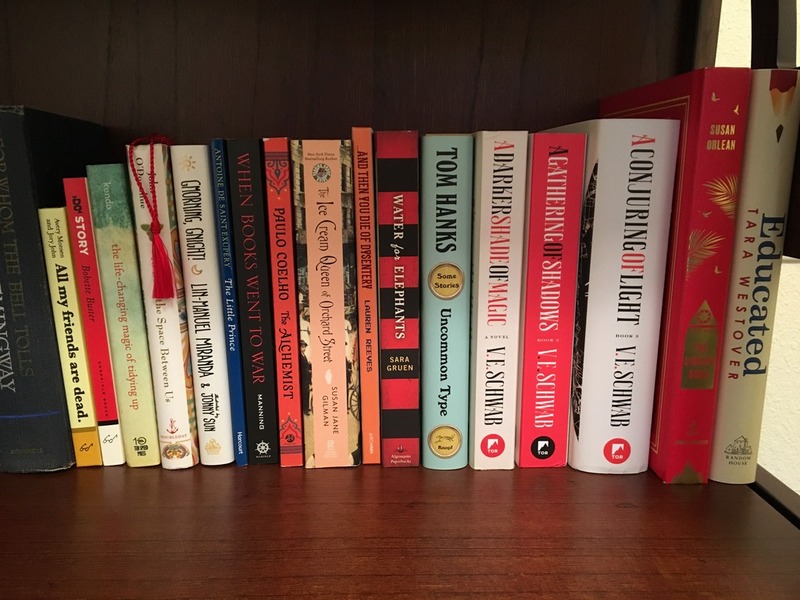 Whenever I visit someone’s house, I love taking a gander at their bookshelves to see what they have, what they like, and see if we’ve got anything in common. To give you some perspective on what you’re about to see, please note that A) I’m in a semi-temporary living situation, so most of my already-read books are sitting in tubs in the attic and B) one of my shelves is separated into 8 little cubes (3 of which hold Blu-Rays), so I’ve taken photos of the individual cubes instead of the whole thing so you can see better. This is a TBR shelf. I’m most excited to read The Angel of Darkness because it’s the sequel to The Alienist, which was amazing. It was like Criminal Minds in the late 1890’s. Simply fantastic. I’m also excited to read The Hundred-Year-Old Man Who Climbed Out the Window and Disappeared because I recently won a giveaway of the sequel. This is another TBR shelf with some ARCs and books that have been recommended to me. I’m most excited about Dead Wake because Erik Larson never disappoints, and Closing Time because Catch-22 is one of my all-time favorite books (and it’s the sequel). I never realized how many sequels I’ve got going on. Hmm. Another TBR shelf (and you sensing a theme here?). Many of these have been given to me or recommended to me. Air recommended The Shadow of the Wind, and I’m excited to read it. I’m also excited to read The Last Days of Night, which is another late 1800’s NYC novel. You guessed it! Another TBR shelf! Only this one is (mostly) non-fiction. In the Footsteps of the Band of Brothers is the only Easy Company book I have yet to read. All of the others are read and in the attic (I have a whole box dedicated to WWII books, including the 101st Airborne scrapbook and the 506th scrapbook. But that’s a subject for another post). I’m most excited to read The Thousand-Mile War which discusses WWII in Alaska (which was also bombed by the Japanese) because my great-uncle served there for 3 years before being sent to Western Europe, and it’s such a little-known arena of the war. This is the last TBR shelf, I promise. I started My Grandmother Asked me to Tell You She’s Sorry but never finished. It just moved too slow for me. Have you read it? Should I give it another go? I’ve heard great things about Fredrik Backman. Maybe I just need to be in the right frame of mind? I’m excited to read Adequate Yearly Progress because having worked in K-12 education for the last 10 years, I feel like it’ll be so relatable it’ll hurt. Alright, as a treat for sticking with me for so long, here are the books in the house that I’ve read (again, there are about 6 tubs in the attic of books that will one day grace an entire wall’s worth of bookshelves). As I read books, they sometimes make their way straight to the attic (for space sake), but these are the ones I felt the need to keep close by for now. Tom Hanks’ Uncommon Type is the best set of short stories I’ve read. You can almost hear Tom reading them to you. When Books Went to War is a fascinating read about the role of novels in WWII which led to the invention of the paperback novel. The Little Prince will never, ever be far away from me. And before you ask, yes – I am hoping to plow through most of those TBR shelves for our 2019 Giddy Goat Reading Challenge! Previous Giddy Goats’ Goals for 2019!